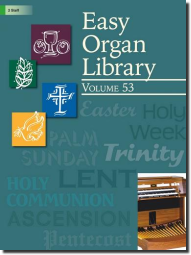 Reprinted from past issues of our highly successful and long-running magazine, "The Organist," this handy wire-bound book of almost one hundred pages of easy organ music for Lent, Palm Sunday, Holy Week, Easter, and general use would be a welcome and much-used addition to any organist's library. Novice players, especially those making the transition from piano to organ, will appreciate the uncomplicated pedal parts, while veteran organists will enjoy the convenient "pick-up-and-play" aspect. Holy, Holy, Holy, Lord God Almighty - Hugh Livingston Jr.